1. Create a new file for each event. You can either create a new file for each month or add each month to a separate tab within this worksheet. 2. Input the details of the event at the top of the spreadsheet. Only fill in the cells that are in blue! 1. Fill in the amount that you requisitioned in the column labeled ‘requisitioned’. 2. Again, only fill in the cells in blue. 3. Add additional rows for additional types of liquor not listed. 1. Input the amount of revenue you collected for the event at the very top of the spreadsheet. 2. Your cost for the event will be displayed right below your revenues. 3. Send a copy of the worksheet to accounting so they can transfer the amount to banquets. All bars have an inventory system, but most bars overlook an important aspect that should be as controlled as any other process. Imagine that your bar revenue begins to decline; more notably, your cash sales. You begin to do your research and your business levels seem to be consistent and all of your costs seem to be in line. You even do a full inventory mid-period to find any discrepancies. Everything seems fine. Can someone be stealing your customers? That person might be right under your nose. Your typical bar will carry a variety of different alcoholic selections, almost all of which can be found in grocery stores. There are no distinctions between the bottles you receive from your liquor broker and the bottles you can buy in the grocery store. What will prevent a shrewd bartender from bringing his/her own bottle of Absolute vodka from the store, and pouring and serving to customers out of it, and pocketing the proceeds without a trace? Your bartender just opened his/her own business in your establishment. Obviously, you cannot have a manager watch each bartender all night looking for any suspicious activity. There is a much easier method that allows you to control this aspect of your liquor operation at a glance; Ensure that you are using a proper bottle for bottle exchange program in your liquor inventory system. An effective bottle for bottle exchange consists of just a few steps. First, obtain a stamp or a set of stickers that is original and difficult to reproduce. Secondly, mark all of your bottles with the stamp or sticker (discreetly on the back of the bottle to maintain appearance) to show that they are the bar’s property. Lastly, add the bottle for bottle exchange to your requisition process. This bottle for bottle method requires the bartenders to save finished liquor bottles and exchange them for new bottles during requisition. The bar will not receive new bottles unless an accompanied empty bottle with the proper stamp or sticker on it is received in return. The manager then properly disposes of the empty bottles so that they cannot be retrieved. With the new changes, managers can easily do spot checks to see if there are any bottles in the bar without stamps or stickers on them. It also provides some additional benefits. Your bar should not run short on any types of liquor anymore as any missed requests in the requisition process will be mostly eliminated due to bottle for bottle exchange. You can be certain that your bar par levels will always be maintained. Any missing liquor inventory will now be the sole responsibility of the bartenders and cannot be blamed on the process. Managers should also consider taking it one step further and disallow personal belongings such as purses or bags behind the bar. This will prevent the use of a personal bottle of liquor to refill the bar’s bottles. Also be sure to use separate stickers for the different outlets you may have so that you do not mix or confuse the bottles with each other. The bottle for bottle exchange will definitely add some extra work and time to your bar’s inventory process. However, it will be worth the peace of mind you will receive knowing that you are making it tougher for bartender’s to steal from you. For the discerning bar manager, a perpetual inventory is a must. A perpetual inventory system is a method used so bar managers can know their exact liquor inventory at any given time. The rule generally is; the more liquor that a bar stocks on hand, the more crucial it is that a bar should use a perpetual inventory system. 2. Build a spreadsheet or database that can store and automatically update and calculate based on your inputs. The simplest way to do this is in Microsoft Excel. Be sure to add in places to log requisitions and purchases. Keep the different outlets and storage room all separate on the spreadsheet. Also, add in the extensions that calculate your total inventory value for each item as well as the total. Be sure to include a second area where you can calculate the important numbers that you would like to see (i.e. pour cost to date). 3. Lastly, find a good time and day to perform a full inventory count. The most preferable time is usually when the normal periodic inventory is done. Count everything and log everything into the database. Now that the system is ready, be sure that the bottle for bottle exchange requisition process is in place, and begin to track each transaction. A good way to approach the situation is to think of each outlet as a separate entity that the storage room is supplying. Now, as all purchases and requisitions are logged as they occur, the database should show exactly how much inventory is in your storage room at any given time. Also, a pretty accurate pour cost can be calculated based on taking your outlet’s sales for the period divided by the requisition costs to the outlet (*Note – At least three months from the system’s launch should be allowed to see the accurate costs). 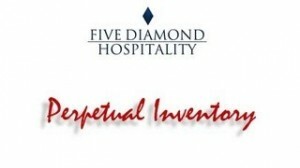 For a pre-made perpetual inventory database, a simple search online can produce many companies that can produce them. However, for one that is catered to your needs and products, find a person that can do basic Microsoft Excel formulas and functions. A very simple, effective one can be built from scratch.